West African governments and their development partners has realized the need to create concrete programs in order to fight soaring international food prices that has started to take a toll since 2007, and that task has been more challenging than meeting the CAADP’s (Comprehensive Africa Agriculture Development Program) goal of increasing the share of national budgets and donner funds to the agricultural sector. West African scholars, Michigan State university, and the Syngenta Foundation for Sustainable Agriculture have developed effective ways in which policies and programs can be used to feed West Africa’s young, and increasingly urban population. Policies need to adapt to reflect major changes in the region. West African governments protected consumers from the effects of instable international prices through measures like tax holidays on imported foods and input subsidies to farmers. However, these measures have had high opportunity costs to local economies, because they absorbed revenues that could’ve been used to relieve basic constraints to greater agriculture productivity. To avoid future price fluctuations, people need to change their consumption habits. Since west Africans are rapidly changing their diets to more perishable and processed foods, focusing on food policies like cereals will be ineffective in addressing the future needs of farmers and consumers. A single food policy focus on farming isn’t enough because this sector lacks from competitiveness in logistics, marketing, processing, and retailing. Greater cross-sectoral policy co-ordination is required for such activities, because they lie outside the domain of the ministries of agriculture. West African agriculture can be very competitive with imports if entire value chains are improved. Dietary patterns are evolving rapidly in West Africa. 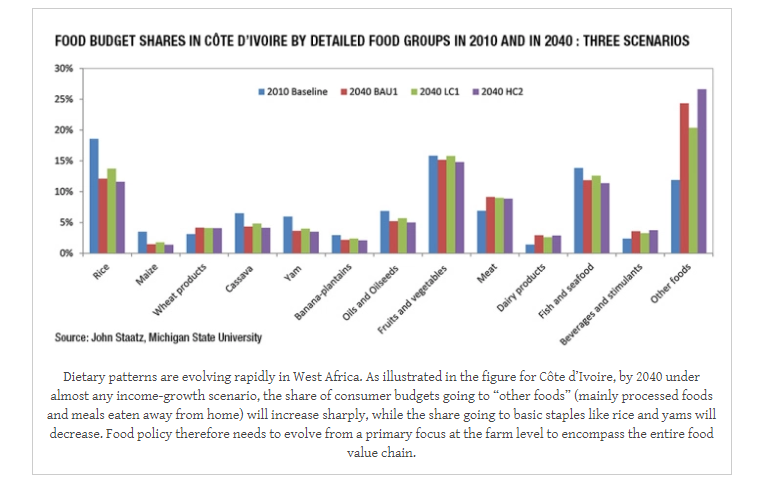 As illustrated in the figure for Côte d’Ivoire, by 2040 under almost any income-growth scenario, the share of consumer budgets going to “other foods” (mainly processed foods and meals eaten away from home) will increase sharply, while the share going to basic staples like rice and yams will decrease. Food policy therefore needs to evolve from a primary focus at the farm level to encompass the entire food value chain. The implementation of expanded contracting between farmers, processors, and exporters often fail although they offer many opportunities. Contracting arrangements need to be carefully designed to the products involved, and to external environments ensuring that enough added value is created for each party to justify the added costs of such systems. Expanded regional integration is key to the competiveness of west African agriculture because such countries lack the scale of economics in critical areas like input manufacture, agricultural research, higher education, and processing to compete with brazil, china, and India. More fluid regional trade is also critical in fostering the substitution of locally processed starchy staples (cassava, maize, millet, sorghum) for imported rice during periods of high grain prices. Expanding regional integration weakens the economic rents that add those who can restrict such trade, and thus, good governance efforts need to focus on changing the incentives of these groups who want to economically hinder regional integration. Efforts to expand regional food trade need to be linked to the creation of more cost effective social programs for the poor. Expanded food exports from low to high income countries is a threat to poor consumers who face the risk of being priced out of the market. Political leaders are pushed to ban exports during periods of high prices because the situation is uncontrollable. In order for a better trade, better programs to protect the poor during rising prices are needed. West African countries and organizations like ECOWAS AND UEMOA, are incorporating these findings in policies like the 2015 25 ECOWAS regional agricultural policy and investment program (ECOWAP + 10). The reality is that designing policies is easier than implementing them, because three main challenges have to be faced. First, local capacity needs to be on multiple levels (regional organizations, commune-level government, and farmer/interprofessional organizations) to study and contribute to policy/program design. Long-term policy relevance and sustainability depends on local knowledge which external consultants are the best complement. Then, the capacity of stakeholder organizations to monitor, evaluate and insist upon effective policy implementation should be bolstered — e.g., in the reform of input subsidy policies. Finally, in a political environment, it’s unrealistic that agricultural and food policies will unconsidered. Efforts need to focus on designing policies/programs which are also motivated by political considerations, so that they help address long term structural constrains to growth. For example, current efforts to promote agricultural mechanization in west African countries end up providing subsidized equipment to large farmers. 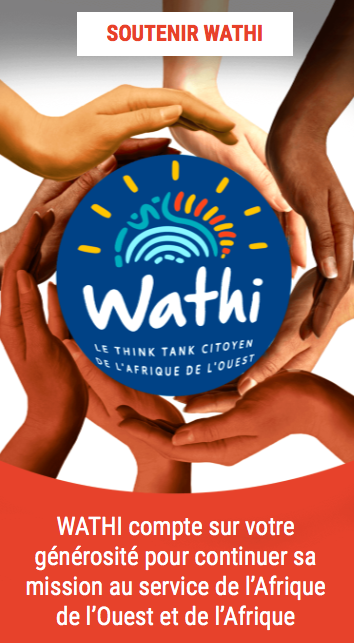 How can such programs be redesigned so that they help young people to launch custom tractor hire services, thereby creating jobs for youth while at the same time providing needed mechanization services to small farmers?